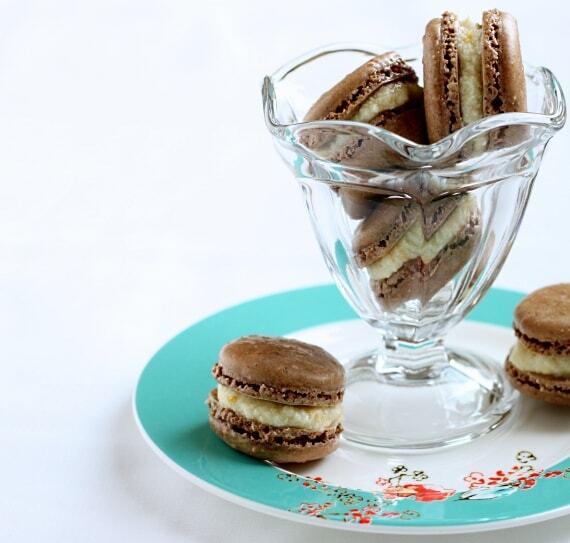 I want to share a quick variation of my French macarons. My parents are visiting for a long weekend, so we’re out gallivanting around doing things that Texans love to do when they come to California: wine tasting, harvesting food from the garden, marveling at the sight of water in rivers, enjoying the fact that when you look east and west you can see hills (we call them mountains) in the distance, and ordering vegetable-centric meals served in small portions at restaurants. Don’t worry, we’ll be back to our old Texan ways soon: drinking frozen margaritas (they were invented in Dallas, ya know! ), tending our cactus gardens, enjoying the Texas sky that’s bigger than anywhere else on earth (if only because the surrounding land is so flat), and eating meat at all 3 meals a day. Ok, I’m exaggerating a bit here, but my point is: Texans enjoy a California vacation just as much as Californians enjoy a Texas vacation. I’ll be back soon with new small desserts and family stories to share. Until then, think of us in wine country wearing cowboy boots and sneaking bites of these cookies between sips of wine. Begin by bringing the egg white to room temperature. Line a small half-sheet pan with parchment paper. In a small bowl, sift together almond meal, powdered sugar and cocoa powder. In a medium bowl, beat the egg white with an electric mixer. Once frothy, slowly add the merginue powder while beating continuously. Once the meringue has soft floppy peaks, stop beating. Then, in 3 increments, add in the the almond meal mixture. Gently fold it in using a spatula (scrape down the middle and sweep the sides carefully). Once everything is well incorporated, scoop the mixture into a plastic bag or pastry bag. This is easier if the bag is inside a tall glass. Squeeze the mixture down to one side and snip off the corner of the bag. Squeeze gently to make 12 perfectly round circles on the baking pan. Use your finger tip to gently press away any peaks. Let the cookies sit at room temperature for 30-60 minutes before baking. Before the cookies go into the oven, they should feel dry to the touch. This takes longer on humid days. While waiting, preheat the oven to 300°. Let cool on the baking sheet, then carefully remove them to a rack to cool completely. In a small bowl, beat together the butter, orange zest and powdered sugar. 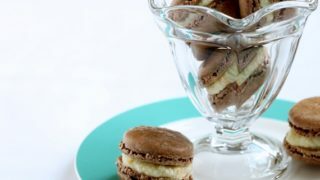 Scoop 1 teaspoon of the buttercream on 6 macarons and top with remaining 6 macarons to form sandwiches. *You truly need older egg whites for these cookies. After I make a dessert using an egg yolk, I put my leftover white in a small bowl covered with plastic wrap. I store it in my fridge for about a week before using it. *I made my own almond meal by finely chopping a scant 1/2 cup of raw, whole almonds. I then grind them in a coffee grinder. Be careful not to make almond butter-2 or 3 pulses is all it takes. Sift very well before using. These look like a gourmet delight! Delicious! Love that you put orange in here! Sounds wonderful! I just put a batch of non-French ( :) ) macaroons in the oven. I’ve been wanting to try the French macaroons since seeing your original recipe. These look wonderful and thank you so much for all of the technique tips! Hope your parents visit is great. Have fun and thanks for all the yummy recipes you post!! Thanks so much for writing. I find meringue powder in the weirdest places: in the kitchen department of the hardware store (in the cake decorating section) and at Michael’s and other hobby stores. If you know of a place that sells those colored candy melts commonly used for cake pops and candies at Christmas, chances are they will have meringue powder. I’ve never found it at a grocery store either. Another option: King Arthur Flour carries Meringue Powder. Just saw it in their catalog. These look perfect! And thanks for the tip about the egg. I have been wanting to make these after I saw an article in Fine Cooking. Love that this is the perfect size recipe as usual! Definitely my kind of vacation! Have a blast with your family! These seriously look like the perfect snack in between wineries! Hopefully the weather gets a bit better for us Californians! I love that you’ve scaled these down. Can’t wait to try it out. By the way, your Tin Roof cheesecake was WONDERFUL (as were your tips on how to keep it from cracking, etc.) Thanks for treating us to these delectable “two-person” desserts! They’re gorgeous! Hope you have a good visit with your parents. How funny, my little brother lives in California and we LOVE visiting him…too true!! love the macaroons, have fun with your parents!! this recipe sounds lovely, thank you for sharing this and your photos are so gorgeous!! i’ve never had much luck with macarons…yours are stunning!! Gorgeous macarons and the orange buttercream seems it would pair perfectly with the chocolate. Happy Baking! Thanks for this recipe; I’ve been meaning to try making these since I had the in France but I love that this recipe is for two and can be made in my toaster oven. Your recipe is perfect. For those of you who can’t find meringue powder you can make these without…I do it all the time. My most favourite flavour in France was chocolate with salted caramel. So I make these macarons but replace the filling with a bit of dulce de leche topped off with a sprinkle of fleur de sel. It creates the most decadent bite. Thanks for your efforts in scaling things down. I really appreciate it! Hi ~ I’m anxious to try this recipe as I just made some that did not turn out well. It seems most recipes I’ve seen have notes about folding the batter until when you pour it back in all the lines should disappear after 10 Seconds. I did this & think it was folded too long. Your recipes says just to fold until all ingredients are incorporated. Any tips here? I’m anxious to try your recipe!